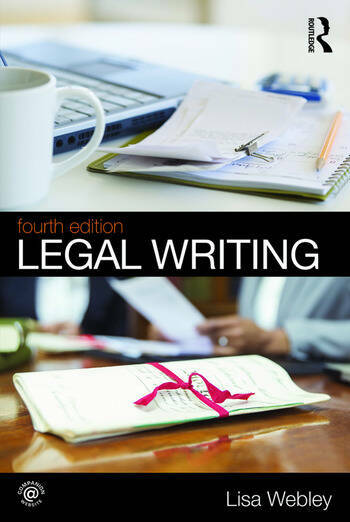 Legal Writing guides students comprehensively through this vital legal skill and addresses a range of assessment methods from exam questions to final essays and problem answers. It considers how to deconstruct essay and problem questions and how to conduct and apply legal research to answer set questions. Lisa Webley explains how to reference others' work clearly and correctly, making this book a useful tool for students concerned about issues of plagiarism. It also focuses on how to develop critical thinking and communicate legal arguments, with both good and bad examples of written work considered and discussed in the text. Legal Writing is particularly useful for undergraduate students, especially at the beginning of degree studies, and for GDL and CPE students too. Guidance on the avoidance of plagiarism including examples of poor practice and best practice. Worked examples throughout the text, including guidance on deciphering essay questions in exams and coursework, along with additional examples from across the legal curriculum on the companion website. An improved companion website with increased guidance for revision to allow students to test their progress and further engage with the topics in the book. Clearly written and easy to use, Legal Writing enables students to fully engage with essay and exam writing as a vital foundation to their undergraduate degree. Dr. Lisa Webley is Professor of Empirical Legal Studies at the University of Westminster and a Senior Fellow at the Institute of Advanced Legal Studies. She teaches on undergraduate and postgraduate courses, including constitutional and administrative law, family law, legal skills, the English legal system and research methods. She is a Senior Fellow of the Higher Education Academy and a Fellow of the Royal Society of Arts.